The Blue Box Podcast - Episode 334: The Kerblam! Review Brought to you every Saturday by Starburst Columnist - JR Southall, Lee Rawlings, Matt Barber and Simon Brett. The Blue Box Podcast - Episode 333: Discussion of Demons Brought to you every Saturday by Starburst Columnist - JR Southall, Lee Rawlings, Matt Barber and Simon Brett. Episode 332: What Would Rick Do? The Blue Box Podcast - Episode 332: What Would Rick Do? Brought to you every Saturday by Starburst Columnist - JR Southall, Lee Rawlings, Matt Barber and Simon Brett. The Blue Box Podcast - Episode 331: The Rosa Review Brought to you every Saturday by Starburst Columnist - JR Southall, Lee Rawlings, Matt Barber and Simon Brett. The Blue Box Podcast - Episode 330: The Rosa Review Brought to you every Saturday by Starburst Columnist - JR Southall, Lee Rawlings, Matt Barber and Simon Brett. The Blue Box Podcast - Episode 329: The Ghose Moment Brought to you every Saturday by Starburst Columnist - JR Southall, Lee Rawlings, Matt Barber and Simon Brett. The Blue Box Podcast - Episode 328: Falling to Earth Brought to you every Saturday by Starburst Columnist - JR Southall, Lee Rawlings, Matt Barber and Simon Brett. The Blue Box Podcast - Episode 327: Hardy and Banks Brought to you every Saturday by Starburst Columnist - JR Southall, Lee Rawlings, Matt Barber and Simon Brett. 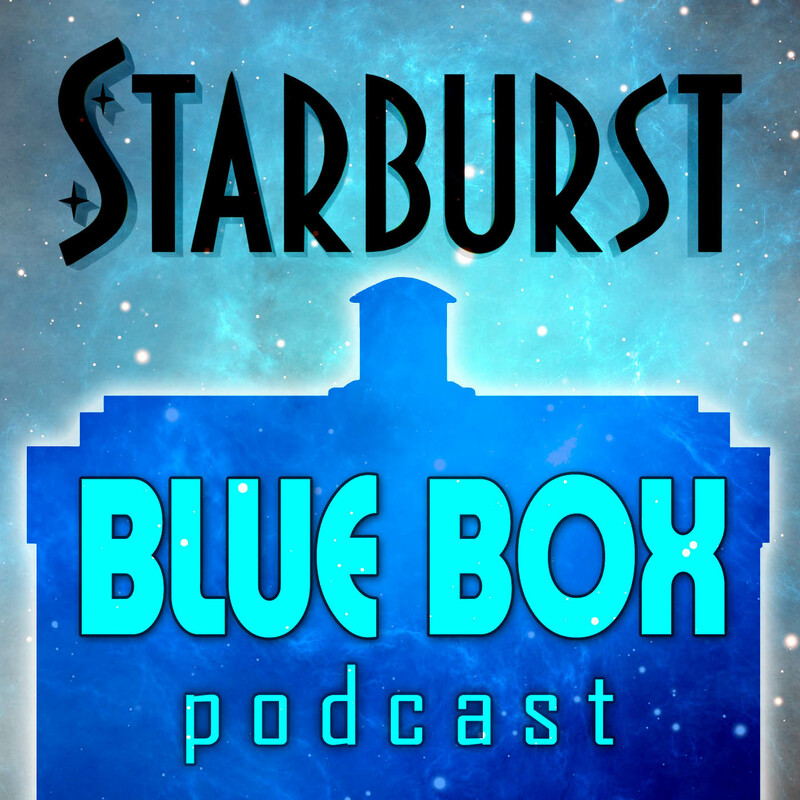 The Blue Box Podcast - Episode 326: Series 11 Preview Brought to you every Saturday by Starburst Columnist - JR Southall, Lee Rawlings, Matt Barber and Simon Brett. The Blue Box Podcast - Episode 325: Tom Talks Turnout Brought to you every Saturday by Starburst Columnist - JR Southall, Lee Rawlings, Matt Barber and Simon Brett. The Blue Box Podcast - Episode 324: Banks and Hardy Brought to you every Saturday by Starburst Columnist - JR Southall, Lee Rawlings, Matt Barber and Simon Brett. The Blue Box Podcast - Episode 323: Modern Mini Arcs Brought to you every Saturday by Starburst Columnist - JR Southall, Lee Rawlings, Matt Barber and Simon Brett. The Blue Box Podcast - Episode 322: Writers and Wrongs Brought to you every Saturday by Starburst Columnist - JR Southall, Lee Rawlings, Matt Barber and Simon Brett. The Blue Box Podcast - Episode 321: The Capaldi Arcs Brought to you every Saturday by Starburst Columnist - JR Southall, Lee Rawlings, Matt Barber and Simon Brett. The Blue Box Podcast - Episode 320: The Smith Arcs Brought to you every Saturday by Starburst Columnist - JR Southall, Lee Rawlings, Matt Barber and Simon Brett. The Blue Box Podcast - Episode 319: Mind Altering Stories Brought to you every Saturday by Starburst Columnist - JR Southall, Lee Rawlings, Matt Barber and Simon Brett. The Blue Box Podcast - Episode 318: Colouring Things In Brought to you every Saturday by Starburst Columnist - JR Southall, Lee Rawlings, Matt Barber and Simon Brett. The Blue Box Podcast - Episode 317: News and Reviews Brought to you every Saturday by Starburst Columnist - JR Southall, Lee Rawlings, Matt Barber and Simon Brett. The Blue Box Podcast - Episode 316: Banks and Smith Brought to you every Saturday by Starburst Columnist - JR Southall, Lee Rawlings, Matt Barber and Simon Brett. The Blue Box Podcast - Episode 315: Aussies and Controversies Brought to you every Saturday by Starburst Columnist - JR Southall, Lee Rawlings, Matt Barber and Simon Brett. The Blue Box Podcast - Episode 314: Keith Barnfather's Top Thirteen Brought to you every Saturday by Starburst Columnist - JR Southall, Lee Rawlings, Matt Barber and Simon Brett. The Blue Box Podcast - Episode 313: River Song's Wedding Review Brought to you every Saturday by Starburst Columnist - JR Southall, Lee Rawlings, Matt Barber and Simon Brett. The Blue Box Podcast - Episode 312: A Solo Review Sidebar Brought to you every Saturday by Starburst Columnist - JR Southall, Lee Rawlings, Mark Cockram and Simon Brett. The Blue Box Podcast - Episode 311: Paul Draper's Top Five Brought to you every Saturday by Starburst Columnist - JR Southall, Lee Rawlings, Mark Cockram and Simon Brett. The Blue Box Podcast - Episode 310: Yes You Rob Lloyd Brought to you every Saturday by Starburst Columnist - JR Southall, Lee Rawlings, Mark Cockram and Simon Brett. The Blue Box Podcast - Episode 309: It's Closing Time Again Brought to you every Saturday by Starburst Columnist - JR Southall, Lee Rawlings, Mark Cockram and Simon Brett. The Blue Box Podcast - Episode 308: Fifty Years of 2001 Brought to you every Saturday by Starburst Columnist - JR Southall, Lee Rawlings, Mark Cockram and Simon Brett. The Blue Box Podcast - Episode 307: The God Complex Review Brought to you every Saturday by Starburst Columnist - JR Southall, Lee Rawlings, Mark Cockram and Simon Brett. Episode 306: Paul and Elton Return! The Blue Box Podcast - Episode 306: Paul and Elton Return! Brought to you every Saturday by Starburst Columnist - JR Southall, Lee Rawlings, Mark Cockram and Simon Brett. The Blue Box Podcast - Episode 305: The Girl Who Waited Brought to you every Saturday by Starburst Columnist - JR Southall, Lee Rawlings, Mark Cockram and Simon Brett. The Blue Box Podcast - Episode 304: A Film Snap Sidebar Brought to you every Saturday by Starburst Columnist - JR Southall, Lee Rawlings, Mark Cockram and Simon Brett. The Blue Box Podcast - Episode 303: Let's Kill Hitler Review Brought to you every Saturday by Starburst Columnist - JR Southall, Lee Rawlings, Mark Cockram and Simon Brett. The Blue Box Podcast - Episode 302: The RTD Story Arcs Brought to you every Saturday by Starburst Columnist - JR Southall, Lee Rawlings, Mark Cockram and Simon Brett. The Blue Box Podcast - Episode 301: Talking A Good Man Brought to you every Saturday by Starburst Columnist - JR Southall, Lee Rawlings, Mark Cockram and Simon Brett. The Blue Box Podcast - Episode 300: Paul Vanezis on Stephen Hawking Brought to you every Saturday by Starburst Columnist - JR Southall, Lee Rawlings, Mark Cockram and Simon Brett. The Blue Box Podcast - Episode 299: Paul and Elton's Top Ten Brought to you every Saturday by Starburst Columnist - JR Southall, Lee Rawlings, Mark Cockram and Simon Brett. Episode 298: Barnfather, Banks and Briggs - Monsters! The Blue Box Podcast - Episode 298: Doctor Who Snap Round Two Brought to you every Saturday by Starburst Columnist - JR Southall, Lee Rawlings, Mark Cockram and Simon Brett. The Blue Box Podcast - Episode 297: Doctor Who Snap Round Two Brought to you every Saturday by Starburst Columnist - JR Southall, Lee Rawlings, Mark Cockram and Simon Brett. The Blue Box Podcast - Episode 296: The Almost Rebel Flesh People Brought to you every Saturday by Starburst Columnist - JR Southall, Lee Rawlings, Mark Cockram and Simon Brett. The Blue Box Podcast - Episode 295: Six Degrees of Who Connectivity Brought to you every Saturday by Starburst Columnist - JR Southall, Lee Rawlings, Mark Cockram and Simon Brett. The Blue Box Podcast - Episode 294: Back to The Doctor's Wife Brought to you every Saturday by Starburst Columnist - JR Southall, Lee Rawlings, Mark Cockram and Simon Brett. The Blue Box Podcast - Episode 293: Unpicking Classic Series Arc Stories Brought to you every Saturday by Starburst Columnist - JR Southall, Lee Rawlings, Mark Cockram and Simon Brett. The Blue Box Podcast - Episode 292: Curse of the Non-Fatal Death Brought to you every Saturday by Starburst Columnist - JR Southall, Lee Rawlings, Mark Cockram and Simon Brett. The Blue Box Podcast - Episode 291: What Do Who Fans Want Brought to you every Saturday by Starburst Columnist - JR Southall, Lee Rawlings, Mark Cockram and Simon Brett. The Blue Box Podcast - Episode 290: Day of the Impossible Astronaut Brought to you every Saturday by Starburst Columnist - JR Southall, Lee Rawlings, Mark Cockram and Simon Brett. The Blue Box Podcast - Episode 289: The Great Last Jedi Debate Brought to you every Saturday by Starburst Columnist - JR Southall, Lee Rawlings, Mark Cockram and Simon Brett. The Blue Box Podcast - Episode 288: Twice Upon a Review Time Brought to you every Saturday by Starburst Columnist - JR Southall, Lee Rawlings, Mark Cockram and Simon Brett. The Blue Box Podcast - Episode 287: Three Blue Box Christmas Stories Brought to you every Saturday by Starburst Columnist - JR Southall, Lee Rawlings, Mark Cockram and Simon Brett. The Blue Box Podcast - Episode 286: The 2017 Christmas Preview Episode Brought to you every Saturday by Starburst Columnist - JR Southall, Lee Rawlings, Mark Cockram and Simon Brett. The Blue Box Podcast - Episode 285: Back to A Christmas Carol Brought to you every Saturday by Starburst Columnist - JR Southall, Lee Rawlings, Mark Cockram and Simon Brett.